If you want a lot of home for the money in a gated community on the east side of Tallahassee, then Lafayette Oaks will likely be your destination. Lafayette Oaks has homes built from the 1970s through the 1980s, but new homes have been built or renovated since that time. 2014 finished as one of the strongest years for home sales in Lafayette Oaks, and that's including more than 24 years worth of real estate reports. In this post, we examine home prices, home values, and home sizes in Lafayette Oaks, and show current listings in the Tallahassee MLS and all closed home sales going back to 1991. For each of the real estate graphs found in this report, you will find the number of closed home sales for each year (red columns, measured on the left vertical axis), and an important real estate statistic shown in blue (measured on the right vertical axis. It is important to note that while the graphs and table will update on a regular basis, the analysis of the information that we provide is current as of this writing in late-March 2015. Average home prices fell 9% in 2014 versus 2013, but have moved 17% higher than the market low established in 2011. 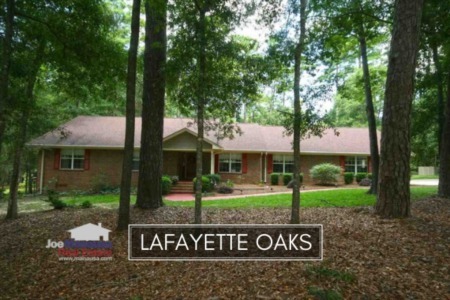 The average recorded sales price was $265,700 for Lafayette Oaks in 2014. Home sales activity last year was hot, soaring above the levels recorded during the most active years from 2002 through 2006. In 2014, there were 22 closed home sales in Lafayette Oaks, but none thus far in 2015. Average home values in Lafayette Oaks shot up a whopping 18% last year, bringing back much of the equity lost during the real estate market bubble collapse. In 2014, the average value of a home sold in Lafayette Oaks was $109 per square foot. This is up 27% over the bottom reached in 2012, and only down about 16% from the market high set back in 2006. The explosion of demand for Lafayette Oaks in 2014 clearly indicates that homes here have been undervalued. 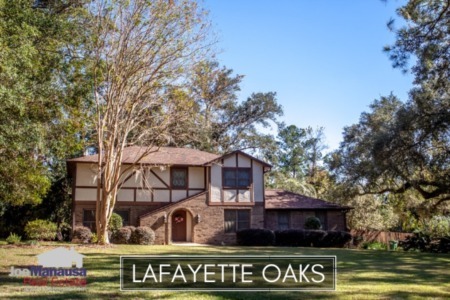 The average home size sold in Lafayette Oaks typically falls in a range of 2,200 to 2,800 square feet, and the buyers last year were selecting homes right in the middle of this range. The 22 home sales in 2014 averaged 2,444 square feet. The following list shows home sales going back to 1991 in Lafayette Oaks. I hope you enjoyed our March 2015 update on home sales in Lafayette Oaks, please feel free to drop me a note if you have questions not covered in this report.